It's my fifth day in Tokyo, and time for us to move hotels. We have to stay at the Mandarin Oriental Tokyo tonight, because that was the only way for us to get reservations for dinner. Since we are just across the street from my old favorite tempura (天ぷら) restaurant in Tokyo, and I always need a good tempura meal when I'm in Japan, I thought it would only make sense to take the gang there for lunch. Hayashi (はやし) is a tiny place with only about 8 seats at the counter. It's not on Michelin's radar, nor does it rank particularly highly on Tabelog. But I was blown away on my first visit 8 years ago, and I've been wanting to go back since then. We were the only customers for lunch today, and the boss gave us a warm welcome and enthusiastically showed us all the ingredients he had prepared for us. He only uses the freshest ingredients, and lamented that it has become harder and harder to find live seafood that hasn't been chilled. Mozuku (水雲) - the noodle-like seaweed from Okinawa (沖縄) was marinated in ponzu (ポン酢) and served with a little ginger. 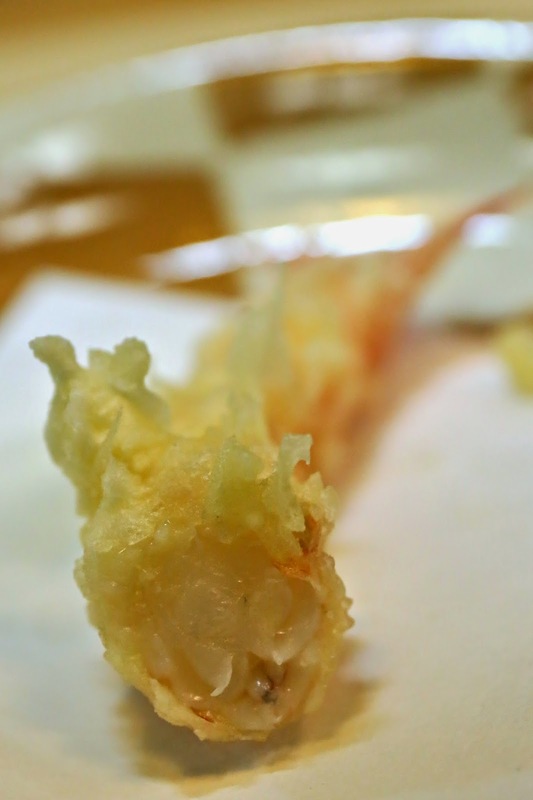 The boss tells us that he uses sunflower oil instead of the sesame oil more common in Edomae (江戸前) style of tempura. Of course everything is done at low heat. The boss then starts on the Japanese tiger prawns (車海老) from Amakusa (天草) in Kyushu (九州). They were still alive and moving, before being stripped of their shells. We would each get three prawns during the meal. Japanese tiger prawns (車海老), rare - the first prawn we got was meant to be done "rare", meaning it wasn't fully cooked as is normally done. And it really was "mi cuit"! Mugwort gluten (蓬の生麩) - from Kyoto. This was very nice. Scallop (帆立貝) - these were pretty big scallops wrapped in a strip of nori (のり) seaweed. This, too, was done mi-cuit. So soft, and the sweetness of the scallop was just amazing. Japanese tiger prawns (車海老), well-done - our second prawn. This was clearly well-done, with a bouncy texture. Next came Japanese sillago (鱚), which were some of the largest I remember seeing. The boss proudly showed us both sides of the fish to let us see the quality of the ingredients he uses. And the result was stunning. A beautiful piece of fish, and very sweet in flavor. We were asked to take half the fish with salt, and the other half with the grated radish (大根おろし) in sauce. Shiitake mushroom (椎茸) - just delicious. Japanese tiger prawns (車海老), rare - our third prawn, and back to mi-cuit. Conger eel (穴子) - the pièce de résistance, and these were pretty big pieces. Really, really delicious. Once again we were asked to take half the fish with salt, and the other half with the grated radish. We were meant to get some shishito peppers (獅子唐辛子), but the boss made a switch and gave us these beautiful butterbur buds (蕗の薹), and actually unfurled the petals. Butterbur buds (蕗の薹) - light bitter taste as expected, and signifies the coming of spring. It was time to get some rice in our bellies, and I asked for a small serving. I was eagerly waiting for this, because of the flakes (ふりかけ) that would be sprinkled on top. These were first invented by the boss' father, who loved mapo tofu (麻婆豆腐) so much that it inspired him to create this. Azuki bean dumpling (小豆饅頭) - something sweet for us to finish with, along with a cup of houjicha (ほうじ茶). At the end of the day, the bill was slightly higher than on my last visit 8 years ago, and remains the most expensive tempura meal I have ever had in terms of the absolute figure. However, given the quality of the food I've had, I certainly would say it was well worth the price I paid for it. Rather than the factory production line lunch that I had at Kondo (近藤) - a place with two Michelin stars to boot - I would much rather come here and pay double the price, but enjoy my lunch at a leisurely pace.